They say, if you practice an activity for three straight weeks, it becomes a habit. 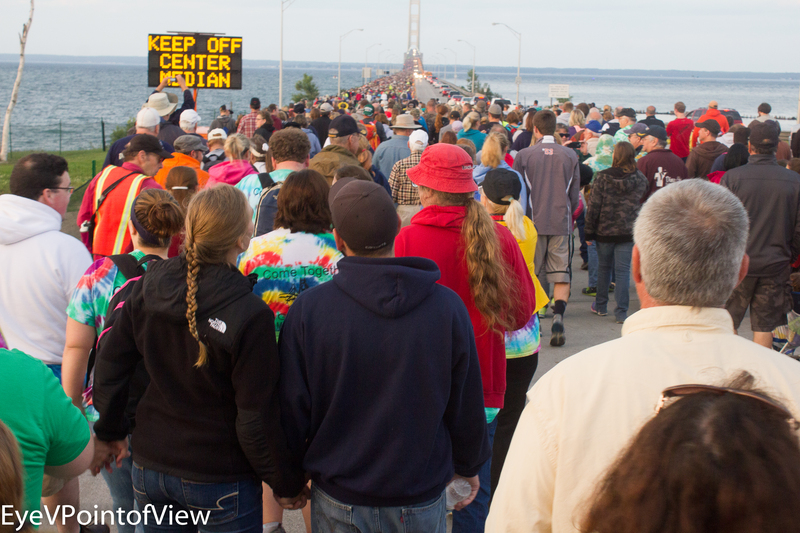 Well, at 56 years and counting, the Mackinac Bridge Walk is more than a habit – it’s a tradition. 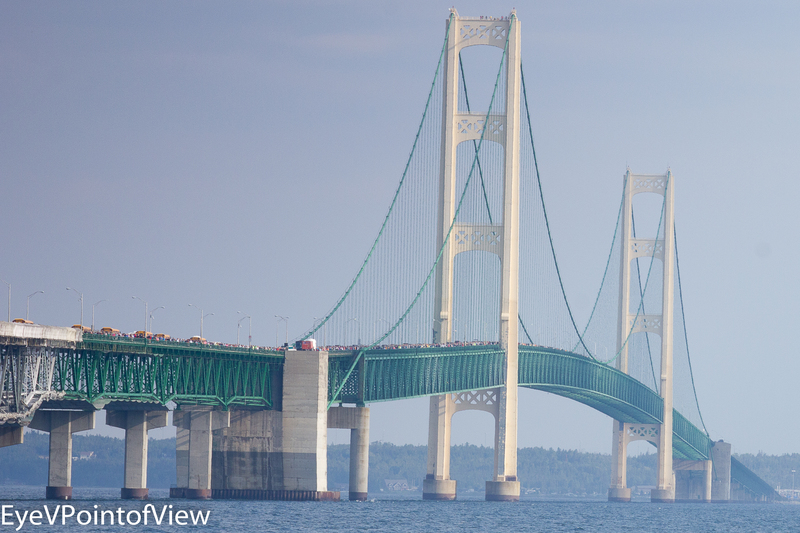 This year, I joined the nearly 40,000 people crossing the 5 mile span of Michigan’s Mackinac Bridge in this annual tradition. Well she thought about it, and two months later, she told me that yes, indeed, she would join my sister and I on the annual Mackinac Bridge Walk. YES! Joining the Masses – The state of Michigan estimated that nearly 40,000 people joined in the annual walk, and we made up four of that group. As you can see from this image, despite the fact that we were in the early wave, having started about 7:30 a.m., there were plenty of folks ahead of us. Sunrise From The Bridge — The sun rose as we crossed the bridge, and despite the fact that no one wanted to stop, we couldn’t resist the lure of this gorgeous sunrise. Freighter Under the Bridge – As we crossed the bridge, a huge freight ship passed under the bridge. 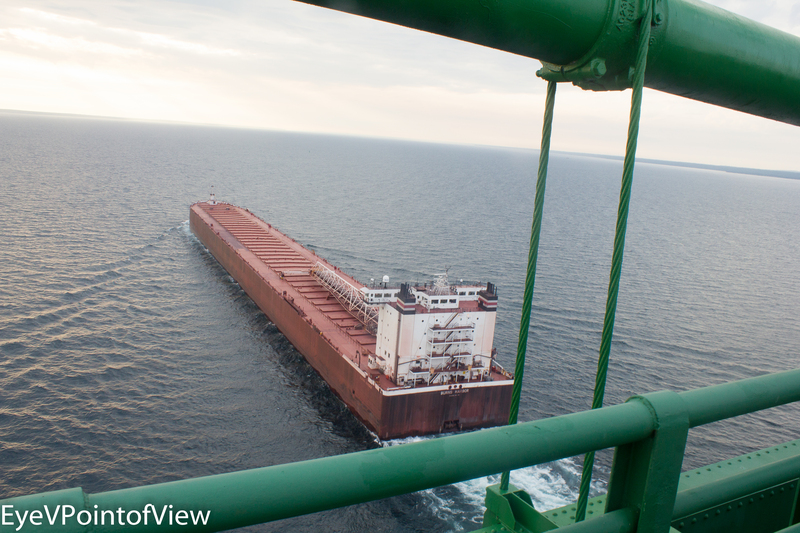 It is scenes like this that really emphasize the size of the bridge and span of the Straits of Mackinac. Doll-face – As with many other events like this, many participants bring along a favored character, wear costumes or conversational hats – in this case, the woman had a doll backpack. 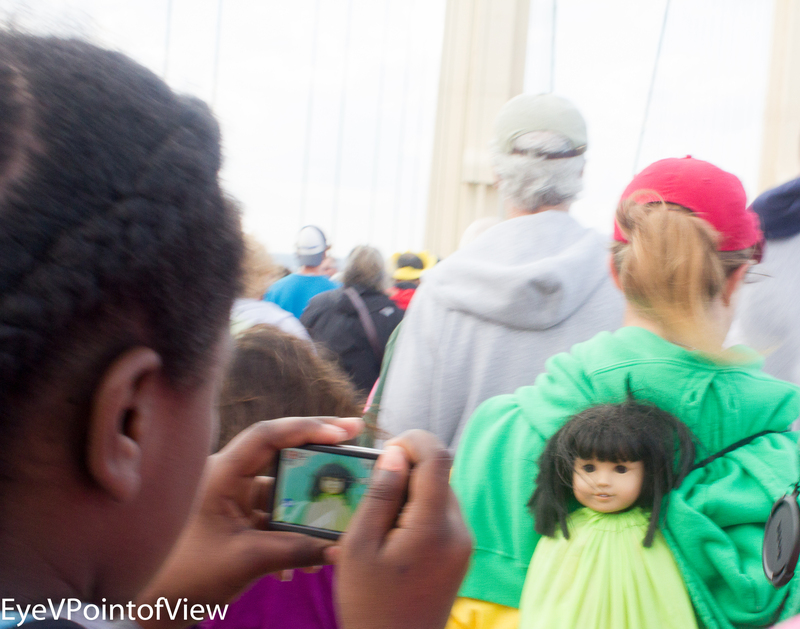 I loved the image of the woman taking photos of the doll face, and seeing the image in her camera. Looking up – This is one of the iconic images of the bridge – looking up as you walk under the north tower of the bridge. Looking through the tower, you can also see the bridge’s south tower. I still couldn’t believe I was there! 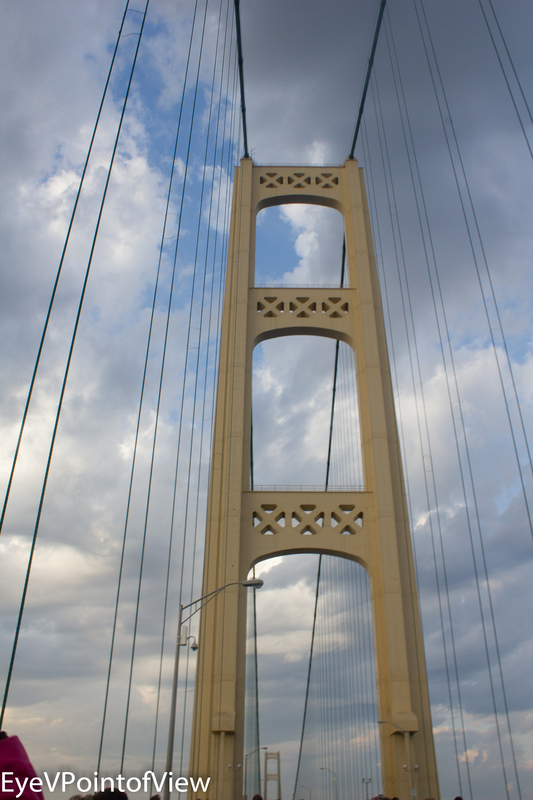 Looking Back – Another iconic image of the bridge, this time from the south end, in Mackinaw City, looking back over the route we took. It was still early, and if you look closely, you can still see the throngs of walkers, thousands strong, still coming over the bridge. After the walk, my niece said to me “Tee Tee Ivy, I’m not afraid of bridges anymore.” So, along with these 5* selections, I have 5* pride in my niece who conquered her fear of bridges. I am sharing both with this post — enjoy! Nice pics! Love the sunset. So pretty and calm. Thanx KD. 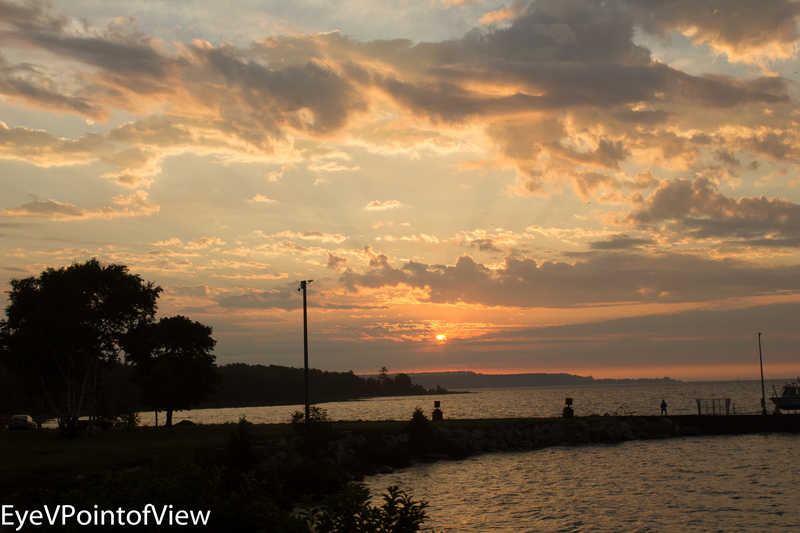 Really had fun taking them, and would recommend the Mackinac Bridge walk if you ever get the chance. Well, I am not encouraging the bungee jump activity – I am sure her mother would have my head! Yes, i think the image would be “cleaner” without that extra person figuring some prominently. Next time, I will have to figure out how to take the photo without the extraneous person. Thanx for that feedback.